Some of the Celtic names in the book are made up from proto-Celtic, proto-Indo-European (PIE) or existing languages like Welsh and Breton. Others are actual names. Nobody really knows exactly how the Iron-age Celts spoke, but I have assumed a similarity to Welsh. In my mind, ‘R’ is usually rolled as in Italian, but if you have trouble with that don’t worry. In fact, please pronounce any name as you wish and if anyone tells you it’s wrong, point to this sentence. Ruthgem – Roll the ‘r’ – the ‘g’ is not soft like the English ‘gem’ nor hard like ‘get’ it is more in the back of the throat like a cross between ‘g’ and ‘h’ I’m really sorry, even I don’t know why, but it is. A few terms in the text may not make sense immediately. So here’s a handy guide to some of the more obscure names. Bellenos – sun god, equivalent to Apollo. Brynno – my imagined Celtic spelling of Brennus. Brigantia – Brighid or Bride, the Celtic goddess who releases spring from the grip of winter. Cernunnos – a horned god. Govanno – a god of alcohol. Poeninos – god of a specific mountain in the Alps. Leucetios – a god of lightning. Taranis – a god of thunder. Lenus – a god of healing. Deus Pater – also spelled Dis-Fater when pronounced by the Germanic Celts of Entwalen-Dun (equivalent to Jupiter/Zeus). Armorica – an area equivalent to modern day Brittany. Ba-dun – a hill fort not far from modern day Dorchester. Boii – a Celtic tribe. Carnuti – a Gaulish tribe. 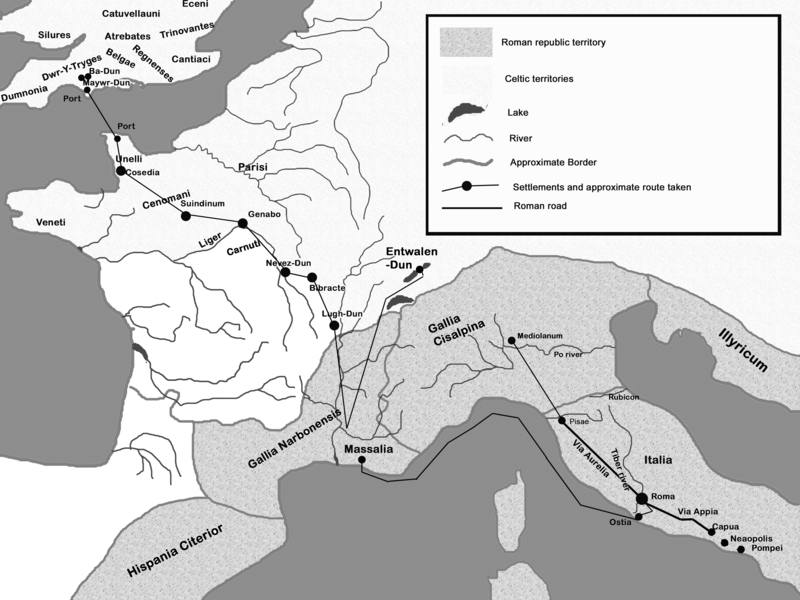 Catuvellauni, Trinovantes, Belgae, Atrebates, and the Cantiaci – some Celtic tribes of Britain. Cosedia – a port in northern Gaul, now modern day Coutances in Normandy. Dumnoreix – a Gaulish chieftain. Dwr-y-tryges – tribal name for the people who lived in Dorset and parts of Somerset. Eceni Mawr – the Iceni (hard ‘c’). Entwalen-Dun – hill-fort between two lakes. Eryri – Eagle people (fictional name of a tribe from a mythical era in the distant past). Genabo – a Gaulish town, Cenabum in Latin, equivalent to modern day Orléans. Keltoi – the Greek name for all the Celtic peoples. Lingones and Morini – Gaulish tribes around modern Belgium. Lugh-Dun – Lugdunum, another Gaulish town. Modern-day Lyons. Massalia – modern day Marseilles. Founded by Greeks but under Roman protection/control by the period of the story. Maywr-dun – a larger hillfort. Maywr means big or great. Narbo – Roman garrison town – modern day Narbonne. Nevez-Dun – a Gaulish town. The name is back- imagined from the Latin Noviodunum. Pretan – the island we now call Britain. Pretani – the people of Pretan – a general term and not a tribal name. Sennoni – a Celtic tribe usually written as the Senones. Silures and Ordovici – Celtic tribes of Wales. Suindinum – chief town of the Cenomanni – modern day Le Mans. Unelli – Gaulish tribe in modern day Normandy. Unellia – land of the Unelli. Ynis-Mona – Anglesey (modern day Ynis Mon in Welsh). Y-Trwsgani – an imagined Celtic rendering of Etruscans. Belotonios – Beltane, the start of summer and the second most important festival in the Celtic year after Samhain. The Celts celebrated the cross quarter festivals, between the solstices and equinoxes. Theirs was emphatically a lunar calendar and it is likely that feasts were held at a significant point on the lunar cycle, not on a fixed date in the solar year. In other words, much more like Easter than May Day. Brachae – trousers. The Celts appear to have invented trousers, instead of wearing tunics and togas as the Romans and Greeks did. Contubernium – a small unit of Roman soldiers consisting of eight legionaries and two supporting servants. Decanus – leader of the ten men in the contubernium. Deru-Weidi – Druids – the name is a back creation based on an ancient word for the oak tree, ‘Deru’, and the root of our modern word Wise, ‘Weido/i’. Imbolc – the end of winter when the ewes start to come into milk and lambing season begins. Around the end of February. Lugunasath – Lughnasadh – the end of summer. Harvest time. Riurios – a month according to the Coligny calendar, approximately equivalent to December. Samonios – Samhain (pronounced ‘Sow-een’) – the origin of our modern Halloween festival and the Celtic New Year. The most important feast in the Celtic year, when the veil between this world and the next is thinnest, allowing for the possibility of communication with the dead. Thermopolia – (singular Thermopolium) a kind of café, not to be confused with Thermopylae, the famous battle.